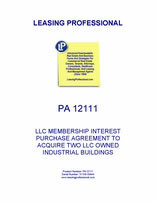 This Purchase Agreement contemplates a structure where the purchaser acquires all of the LLC membership interests in the LLC that holds title to the real estate. In this particular case, the underlying real estate consists of two industrial buildings occupied by several tenants. The incentives to structure the acquisition of real estate this way may include (depending upon the jurisdiction involved) the avoidance of having to purchase expensive documentary stamps for the transfer of the deed, or otherwise having to pay expensive transfer taxes. 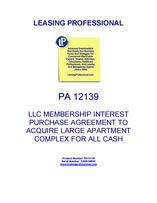 This Purchase Agreement is for a transaction in which the buyer acquires all of the LLC membership interests in the LLC that holds title to a large apartment property. The acquired property consists of a large apartment home development with related amenities and recreational facilities occupied by hundreds of residential tenants. This agreement contemplates an all cash sale. The agreement provides for an inspection period allowing the buyer to inspect the physical condition of the property as well as its title and other attributes. The incentives to structure the acquisition of real estate this way may include (depending upon the jurisdiction involved) the avoidance of having to purchase expensive documentary stamps for the transfer of the deed, or otherwise having to pay expensive transfer taxes.